In the Admin menu choose Server Administration → Org Unit Proximity Adjustments. Click New OU Proximity Adjustment. Choose an Item Circ Lib from the drop down menu. Choose a Hold Request Lib from the drop down menu. If this proximity adjustment applies to a specific copy location, select the appropriate Copy Location from the drop down menu. If this proximity adjustment applies to a specific material type, select the appropriate Circ Modifier from the drop down menu. If this is an Absolute proximity adjustment, check the box next to Absolute adjustment? If you leave the box blank, a relative proximity adjustment will be applied. Enter the Proximity Adjustment between the Item Circulating Library and the Request Library. This will create a one-way proximity adjustment between Org Units. 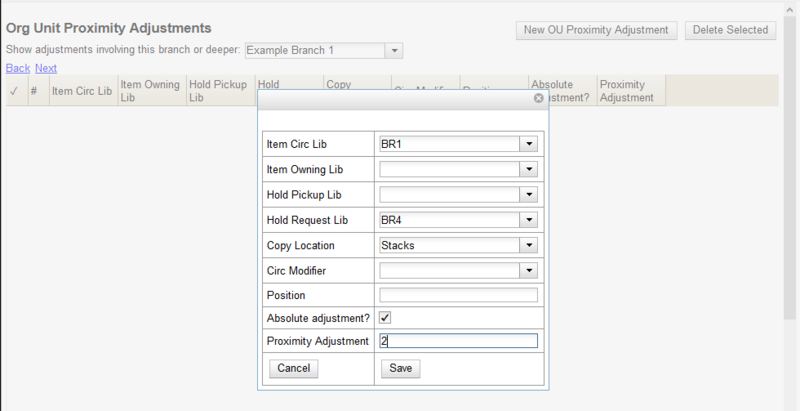 In this example this adjustment will apply to items requested at by a patron BR4 and filled at BR1. To create the reciprocal proximity adjustment, for items requested at BR1 and filled at BR4, create a second proximity adjustment between the two Org Units.